I started in 3ds Max but then moved into Zbrush to use the IMM tools and the new polymodeling tools to speed up the creation of the flat greebly areas. That's about the best reference I can find and no one has really done a very good and accurate model so I'm just kind of winging it a bit as I go and trying to get the general form. I made some of my own IMM brushes and am using some of ZBrush's standard greeble IMM brushes as well. This is going to go great with your Aries. 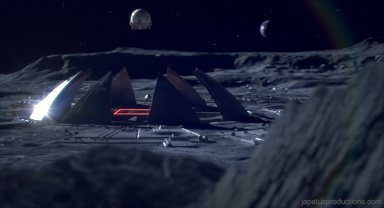 It is hard to find good references of the Clavius moon base. Are you going to be working with screen caps from a Blu-ray? This is one of the only models in 2001 that bothered me: there is no reason to have those leaves retract into the ground. It wastes space that could be useful in other areas. It seems more reasonable to me to have an iris or something similar. But that's still some damn impressive work for the era. Sometimes I really wish movies could move back into that type of production. It would make things ever-so-much more visceral and real. But I digress. Looking really nice on the model! Your attention to detail is very good and you have (from what I can tell so far) no mesh errors in a fairly complex piece. What scale are you working on with this? Thanks guys, I have most of the dome built in 3ds Max, on my home computer and haven't yet married the two over. LockeFP, I agree it's weird to have something like that especially since the Aries ends up being retracted into the ground, but damn if it isn't cool! I'll be making this at a "life-size" scale since I have a 3D Aries model that I'd like to put in there. Tralfaz yes I have some screenscaps from the blu-ray I was given plus some photos I found of the model but which are unfortunately only slightly helpful as they are not too hi-rez, but the dome is off. So like I said not much ref out there, but I'll do my best and make it interesting looking, if not exact. 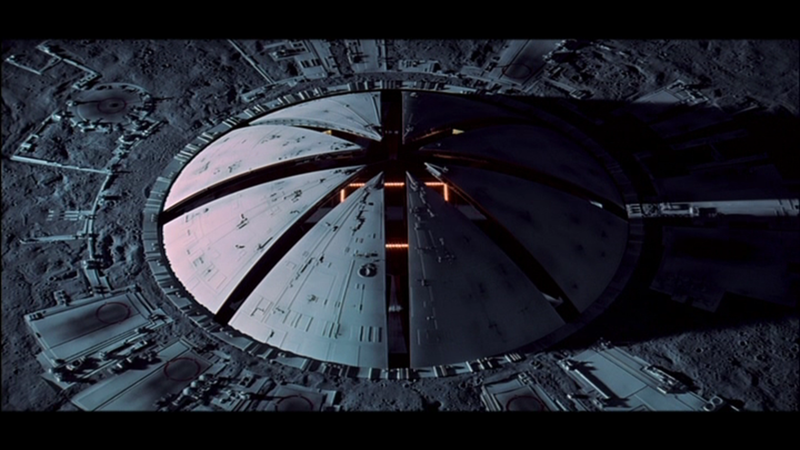 Reminds me of Moonbase Alpha too. An updated version, I made some cratered geometry using World Machine and then brought that into ZBrush and made it into an alpha to get some quick groupings of craters...nice handy program! Looking great, loving your Lunar surface detailing. Ok, worked on the dome greebles and the interior landing area...greebles looking pretty good i think! On the first image...not sure if it's my monitor cuz they are so different...does the image look a little blue or REALLY BLUE on people's monitors? I need some new monitors..
On my screen, the top image has a kind of a saturated gray-ish blue color. The bottom image looks like the scene has been lit with a white light. This is looking really good so far. I'm going to have to pull out my DVD of the movie pretty soon, this is putting me in the mood. Looking good. With that previous image comparison, to my eye the first one looked just right in relation to the screen cap at the beginning of the thread, the second image just looked almost monochrome by comparison, no colour at all other than grey and the red of the landing lights. On the latest image there is a bit of the moon surface in the lower right hand side of the screen that looks a little blurry, so you might need to take a look at the mapping in that area. Other that that? Its looking awesome. Thanks Talon, yeah it's really such a grey on grey type of image, I'll be doing post color correction to make it bluer or something in the end. I've added some interior rooms and worked on the materials a little. I added some normal-mapped paneling to the underside of the dome...I want to replace some of the greebles on the outer wings of the base, but I think this is getting pretty close! I will also of course add my Aries model in the center, maybe another one out on the other landing pads. Beautiful work. I can hear the music playing in my head as I look at these images. That is really amazing. Didn't realize just how large the domes were in relation to the Aries. Incredible. So cool to see this thing come to life. Thought you might be interested in this japetus. The original Aries 1B studio model has been found and is up for auction. You can read about it and see some photos over at the RPF. Holy crap that model is HUGE...I had no idea...there are some sweet decals there too!